Two apprentices who completed four-year-long courses with the G&H Group have been given permanent full-time positions with the business. 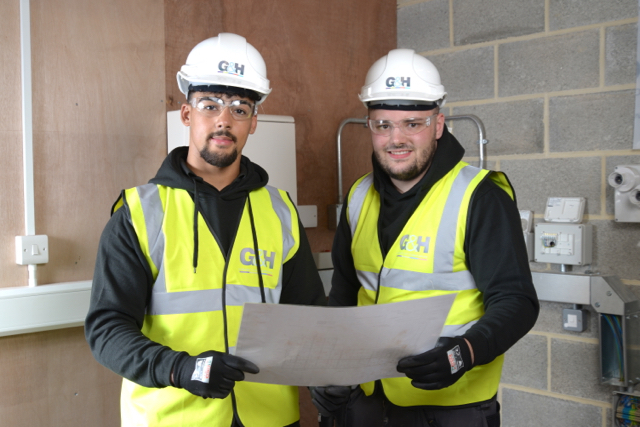 Dion Henry and Connor Shaw joined G&H in 2014 learning a range of mechanical and electrical (M&E) skills on-site while also studying at Leeds College of Building. Dion has been appointed as an Electrical Engineer while Connor is a Heating and Ventilation Engineer, both with G&H Building Services. Dion Henry (left) and Connor Shaw. Dion Henry said: “G&H was the perfect company for my apprenticeship because I got chance to do a bit of everything so I had a really good understanding of M&E. “If I needed certain experience or to show something specifically in my portfolio then I could get it by working on particular jobs, which was a great help. “If there was anything that I needed or was stuck on I could just ask a member of the team or make a phone call to get the help that I needed. In September, the G&H Group welcomed 12 new apprenticeships with eight in its Building Services division, two in Fabrication and one each in its Maintenance and Air Conditioning divisions. Connor Shaw offered some advice to the latest intake. He said: “Really listen to what you’re being told and you will learn a lot. “Always think a step ahead when working on-site with experienced engineers and think what do they need to do next and how can I help them out. Managing Director of the G&H Group, Graham Kelly, said: “Dion and Connor are the latest apprentices we have taken on in full-time positions and they are both excellent engineers. “They really worked hard throughout their four years showing a willingness to learn and genuine enthusiasm. “As well as being on-site and studying at college, they were mentored by our experienced professionals and spent time with the Group’s five divisions to gain a broad understanding of the M&E sector.